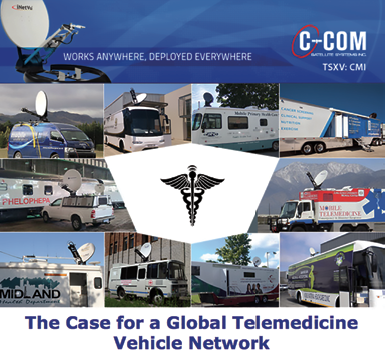 C-COM Satellite Systems has released a new white paper authored by Drew Klein, the company’s Director of International Business Development, entitled The Case for a Global Telemedicine Vehicle Network. This is a call to Doctors, Government Health Workers, Hospitals, Universities, Vehicle/Coach builders, Satellite Operators, Satellite Service Providers, System Integrators, and all who are involved in the Telemedicine space. Geographical areas with limited to no healthcare accessibility regions are called ‘medical deserts,’ and they continue to expand as people move out of rural regions and into cities. Medical deserts can be found in both developed and developing countries alike. In the United States, approximately 30 million people live more than 30 miles from a hospital that provides emergency care. HTS next generation satellites leverage spot beam waveforms to achieve approximately 20 times the throughput of previous generation satellites. In Niger, more than 60 percent of the population (10 million people) live further than a one hour walk to a basic healthcare center. While Africa is urbanizing, approximately 63 percent of the total Sub-Saharan population still live in rural areas. Even France, often lauded as a prized model for national healthcare, has struggled with a steady decline in rural doctors, notably general practitioners. Both the CDC and the NIH have confirmed that a direct correlation exists between distance to hospitals and an increased risk of preventable death. In India, for example, it was estimated that 50,000 deaths (out of 72,000) from sudden abdominal conditions in 2010 could have been averted with better medical access. Those who lived more than 100 km. from a hospital were at the highest risk. A 2016 study showed that only one in eight high income countries had developed a national policy on hospitals in rural or remote areas. Rural healthcare facilities have historically been a poor investment and their sustainability is concerning. Even in the U.S., 83 rural hospitals have closed since 2010 with another 673 vulnerable to shut down. The problem isn’t likely to improve so long as the cost of building hospitals in rural areas remains prohibitive. According to one Harvard study, for every $1 spent on mobile healthcare, there is a return of $36 to the healthcare budget. Mobile surgical vehicles, mobile MRI/CAT/Mammography/Ultrasound clinics, mobile maternity, mobile primary health care (Medical/Dental/Vision), and many other types of telemedicine vehicles can be strategically circulated throughout the world’s medical deserts, bringing healthcare to billions of people. While healthcare costs vary dramatically from country to country, a sad reality is that it will never be economically feasible to build hospitals or health care facilities in all the world’s medical deserts. 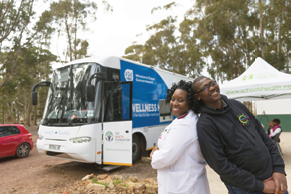 Providing mobile clinics to people who live in hospital deserts is both cost effective and efficient. This white paper recommends the identification of the world’s medical deserts and to create a Global Telemedicine Vehicle Network — build and deploy 216,000 telemedicine vehicles for the delivery of basic and specific health services to rural and peri-urban populations. During Euroconsult’s annual World Satellite Business Week, awards were presented to the four most promising start-ups, as selected by an independent jury, after a pitch competition during the FinSpace cocktail reception at Euroconsult’s Summit for Satellite Financing, which brings together the leading decision makers of the satellite-enabled business sector. FinSpace is supported by MAXAR and Global Space Ventures. The participants had the opportunity to present their projects during the FinSpace event and cocktail reception and also received 10,000 euros worth of Euroconsult’s research products and coaching from Global Space Ventures. Jean-Jacques Dordain, Jury President and Member of Advisory Board, SpaceResources.lu, said that the success of the second edition of FinSpace is one of the many signals of “new space” taking momentum in Europe. Its growth involves more and more entrepreneurs and investors, more and more companies, long standing and new, big and small, from the space sector and from outside the space sector, all with the support of space agencies. The movement is now irreversible along a sustainable path paved with more and more clusters and ecosystems covering the total value chain. Congratulations and long life to the four winners. Pacôme Révillon, CEO, Euroconsult, added that the future and growth of our industry will be shaped through innovative ideas and disruption. The FinSpace Awards recognize the most promising start-ups for their outstanding new concepts and initiatives, while at the same time facilitating exchanges and the formation of partnerships between them, established industry players and investors. Mitsubishi Heavy Industries, Ltd. (MHI) and JAXA have successfully launched H-IIA Launch Vehicle No. 40 (H-IIA F40), which encapsulated the Second Greenhouse Gases Observing Satellite “IBUKI-2” (GOSAT-2) and KhalifaSat, a remote sensing Earth observation satellite — the launch occurred at 13:08:00 on October 29, 2018, (JST) from the JAXA Tanegashima Space Center. The launch and flight of H-IIA F40 proceeded as planned. The separations of GOSAT-2 and KhalifaSat were confirmed respectively at approximately 16 minutes and 09 seconds and 24 minutes and 15 seconds after liftoff. GOSAT-2 developers enhanced the satellite’s focused, target-point observation capabilities (target-point observation functionality), enabling the device to gather accurate readings from a broader range of target points — an ability that will be especially beneficial in evaluations of industrial areas, densely populated areas, and other areas with large quantities of greenhouse gas emissions. *1 ppm is a unit that shows“parts per million”; 1 ppm is equivalent to 0.0001%. *2 ppb is a unit that shows“parts per billion”; 1 ppb is equivalent to 0.001 ppm or 0.0000001%. The IBUKI-2 is also capable of monitoring carbon monoxide concentrations. Whereas carbon dioxide not only comes from anthropogenic sources such as industrial activity and fuel combustion, but also has natural origins in forests and biological activity, carbon monoxide emissions are byproducts of human activity alone — not the natural world. Analyzing combined observations of carbon dioxide and carbon monoxide will give researchers an effective means of estimating carbon dioxide emissions from anthropogenic sources. Airborne PM 2.5 has also become an increasingly concerning health hazard. 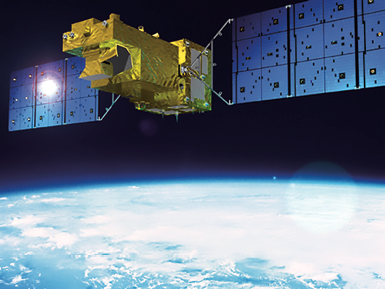 The GOSAT-2 will help monitor PM 2.5 by gathering the data that scientists need to estimate PM 2.5 concentration levels. The KhalifaSat from the UAE’s Mohammed Bin Rashid Space Centre (MBRSC) is the first satellite built by Emirati engineers and is the third remote sensing satellite owned and operated by MBRSC. This satellite will boost the UAE position and competitiveness in satellite manufacturing and operations around the world. In a statement from Mitsubishi Heavy Industries regarding this launch, the UAE Mohammed bin Rashid Space Center’s (MBRSC) KhalifaSat satellite was successfully delivered into orbit via the H-IIA launch vehicle F40. The launch vehicle trajectory was executed as planned, and at about 24 minutes after liftoff, separation of the KhalifaSat satellite was confirmed. 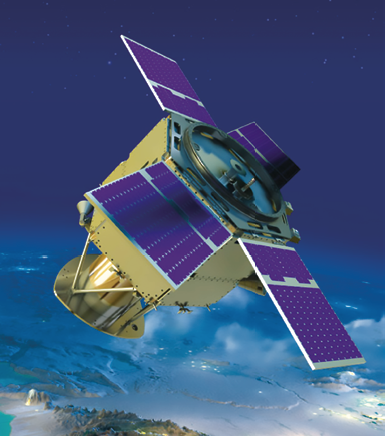 Artistic rendition of the MBRSC’s KhalifaSat on orbit. This mission was performed along with Japan Aerospace Exploration Agency’s (JAXA) Greenhouse gases Observing SATellite-2 ”GOSAT-2” satellite, in which the separation of the GOSAT-2 satellite was also confirmed 16 minutes after liftoff. Additionally, MHI holds the launch service contract for the Emirates Mars Mission (EMM spacecraft, planned to be launched in 2020), through which it hopes to build upon a strong and lasting relationship with the MBRSC and UAESA (UAE Space Agency). The H-IIA launch vehicle is Japan’s flagship launch vehicle and one of the most reliable launch vehicles in the world. This launch was the 41st consecutive successful H-IIA/H-IIB launch, with an accumulative success rate of 97.9. 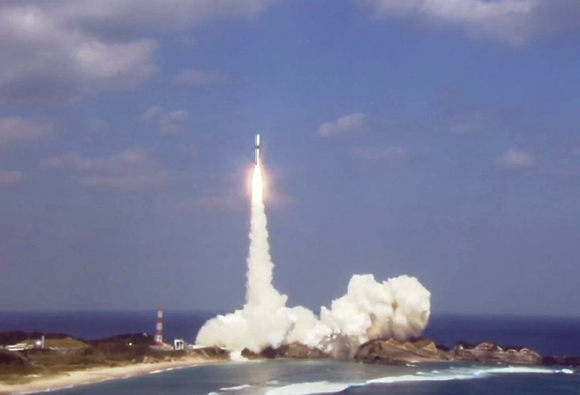 The successor to the H-IIA — the H3 Launch Vehicle — has been developed by MHI and JAXA. The concept of the H3 is highlighted to be much more customer-oriented by offering affordable pricing, relaxing environmental conditions for satellites and drastically reduced preparation time from contract to launch. The new launch vehicle will allow for more flexible and cost-efficient launch services, and is scheduled to make its maiden flight in 2020. His Excellency Hamad Obaid Al Mansoori, Chairman of the Mohammed bin Rashid Space Centre (MBRSC), said that the successful launch of KhalifaSat; which bears the name of His Highness Sheikh Khalifa bin Zayed Al Nahyan, President of the UAE, marks a new milestone for the space sector in the UAE and the region. The first satellite fully manufactured in the United Arab Emirates at MBRSC facilities by Emirati engineers is in line with the directives of the leadership in transforming the UAE into a regional and international hub for space science and technology. Artistic rendition of the GOSAT-2 satellite on orbit. He added that with its five patents, MBRSC believes that KhalifaSat will play an important role in aiding organizations around the world in getting accurate data related to environmental changes and urban planning as well as support relief efforts at times of natural disasters. The company appreciates the valuable role played by the firm’s Japanese partners and thank them for their support in all the stages of this major project, providing all the necessary facilities to ensure that KhalifaSat is delivered successfully into space. Naohiko Abe, SVP and Head of Integrated Defense and Space Systems of MHI, expressed his appreciation to all involved in the launch campaign for the devoted support and cooperation. In particular, he greatly appreciated that UAE’s Space Agency and MBRSC continuously supported and cooperated with the company throughout the three and half years since MHI received the contract in February of 2015. The UAE government is the third overseas customer for MHI’s Launch Services. With the results of this launch, the H-IIA and H-IIB have achieved 41 consecutive successful, on-time launches. Abe noted that MHI intends to expand their launch services business as the leading company of the Japanese space industry. Moreover, MHI is developing the H3 in partnership with JAXA. In succession of the H-IIA/IIB, the H3 will be a reliable and affordable next generation launch vehicle with a maiden flight planned for 2020 and the company expects to be awarded with H3 launch service contracts from potential customers in the upcoming days. NSSLGlobal has signed a three-year contract with offshore support vessel provider Wind Energy Marine — this contract is for the deployment of NSSLGlobal’s FusionIP VSAT terminal in addition to the firm’s Oceanic Dynamics system aboard Wind Energy Marine’s new Crew Transfer Vessels (CTVs) that operate from Nordsee Farm, near Bremen, Germany. 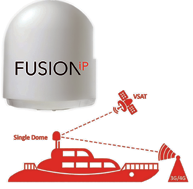 FusionIP will automatically switch between VSAT and cellular connectivity, while the Oceanic Dynamics suite will centralize vessel performance, and assess the impact and “push on forces” reported on offshore structures. 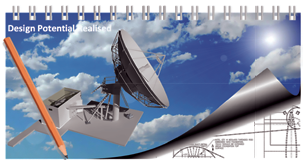 A unique “antenna solution” was developed and specifically engineered in-house to enclose and protect two antennas ensuring the seamless transition between the networks. According to the company, no other service provider offers a single radome solution combining both cellular and VSAT connectivity, allowing maritime vessels to automatically switch between 4G/3G and satellite networks. The FusionIP antenna dome is contained within a compact 60 cm. radome, ensuring that it can be installed on a wide range of vessel types. 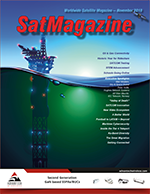 Ensuring cost-effective and efficient fleet management, Oceanic Dynamics will provide Wind Marine Energy with the ability to monitor engine data, route information and GPS positioning, fuel efficiency, seasickness and whole body vibration HSE analysis, as well as passenger comfort and well-being analysis that allows vessels to contextualize cost efficiencies and ensure total onboard awareness with the help of a CCTV suite.The new system will also allow Wind Energy Marine to maximize on cost savings by improving efficiencies. Paul Rutherford, Service Engineering Director at NSSLGlobal, said that Wind Energy Marine has been building their presence in the market and NSSLGlobal is delighted that firm has decided to invest in the company’s solutions to further strengthen their growth. A three-year contract is a real demonstration of its commitment to NSSLGlobal technology and the implantation of the a combination of two NSSLGlobal flagship solutions that will ensure seamless network coverage and efficient vessel performance. Andrew Bagshaw, Managing Director at Wind Marine Energy, added that NSSLGlobal has demonstrated the expertise, experience and superior quality of solutions which the firm was seeking to support the company growth in the maritime marketplace. Oceanic Dynamics will be indispensable in terms of ensuring efficiency and consistent quality of Wind Marine Energy services, while the FusionIP terminal will allow the firm to stay fully connected to the company’s shipping network at all times. The team at NSSLGlobal has also been extremely hands-on throughout the installation process, which was completed without a hitch. Kratos Defense & Security Solutions, Inc. (Nasdaq: KTOS) has been awarded a contract by SKY Perfect JSAT Corporation (SJC), to design and build gateways for SJC’s new High Throughput Satellite (HTS) network — the JCSAT–18 HTS satellite, launching in 2019, will deliver broadband and mobile communication services to Asia Pacific and Eastern Russia. Kratos will design and build a state-of-art Ka-band multi-site gateway solution for SJC’s new JCSAT-18 satellite. Kratos’ breadth of gateway solutions are assembled and tested in Kratos’ integration facility to enable rapid on-site assembly and commissioning. This results in both higher quality and faster time-to-market than traditional piecemeal ground station deployments and protects SJC’s investment by reducing complexity and risk. 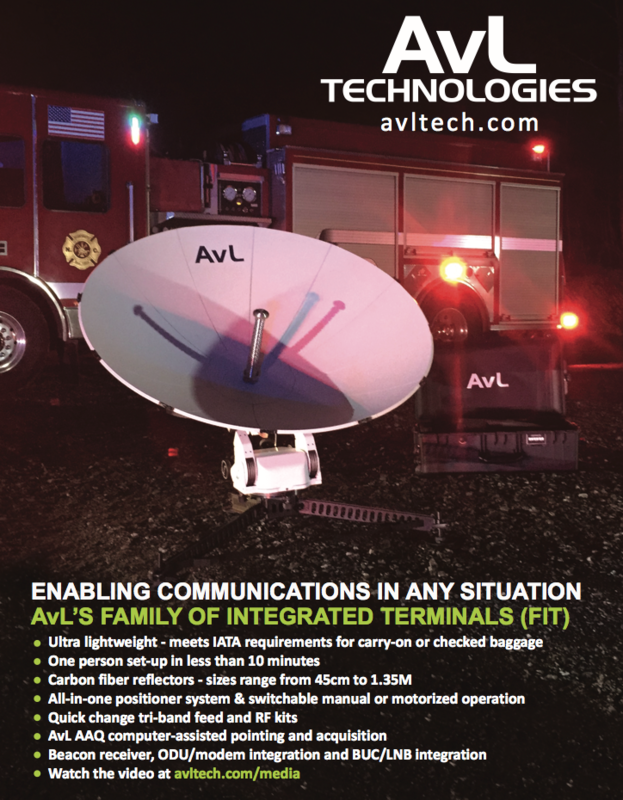 Successful delivery of these types of high-bandwidth services requires important changes to the current ground infrastructure which is designed and optimized for traditional satellite operations. Kratos is leading this industry evolution by offering a broad portfolio of integrated Kratos products that provide satellite operators the most comprehensive and seamless gateway solution in the industry. Kratos’ gateway solution includes a broad array of ground station services from monitoring and control and network management products through high-performance antennas. This enables satellite operators to maximize their HTS business model investment by reducing risks and costs while improving time-to-market. The SJC contract award is for a multi-site gateway solution that will include Kratos’ high-performance 13 meter Ka-band Turning Head Antennas and Compass® monitoring and control system. The pre-integrated solution will be installed at various SJC locations with control equipment centralized in the company’s Network Operations Center.